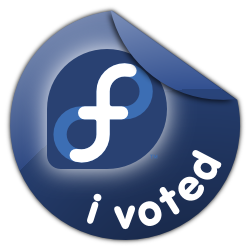 Fedora Elections – get your last-minute votes in! The Fedora Elections for two Board seats, four Engineering Steering Committee seats, and all seven Ambassadors Steering Committee seats has just a few hours left (ends 2009-12-16 UTC 2359). I’m excited that we have such a great slate of candidate volunteers for these important positions of leadership in our community – it really speaks to our ability to incorporate new contributors and help stretch the Project in new directions. I’ve been pleased to be a member of the Board for 3.5 years now, and hope you would consider re-electing me. If you haven’t already voted, please take a few minutes to do so. If you have already voted, thank you. I’d also like to thank John Rose for stepping in as Election Coordinator – a mostly-thankless yet critical task that ensures a smooth election process. Also special thanks to Thorsten Leemhuis for coordinating the election questionnaire (for the last time!). Informally I asked several attendees at FUDCon Toronto if they felt that the questionnaire was helpful to them, and universally I heard that it was indeed helpful. It takes a fair bit of time to gather the questions, sort for “really good” questions, gather the results, and of course, for candidates to answer. I’m glad it provides benefit proportional to the effort, and remind community members that next election cycle (Spring 2010), someone else will need to take on this task that Thorsten has done for several cycles now. Moksha, by Luke Macken. My camera cut out after the first 10 minutes, so that’s all we’ve got. The last 20 minutes of the Fedora Infrastructure: Sysadmins vs. Developers love-in, taken by Adam Williamson. If anyone else has video or audio from this or other Fedora events you’d care to share, please contact me and I’ll help you get it into proper ogg format, tagged, and posted to Fedora Infrastructure servers for distribution.